"We're not really into subtlety," says Roland Lesterlin, the director of Just Cause 3, as he and another developer from Avalanche Studios blow up an offshore oil rig in the game. He's really describing the whole Just Cause series. Avalanche's adventures tend to marry the openness and freedom of Grand Theft Auto with a litany of explosions. Even with that history, though, it's hard to do justice to the destruction set off by Rico Rodriguez, Just Cause 3's hero, within just seconds of this stage demo at a pre-E3 event. Lesterlin says his team wants players to "always be laughing" while playing Just Cause 3. Indeed, my time with the demo certainly had me chuckling at the game's seemingly boundless capacity for chaos. Medici is so lush you just want to blow up everything on it. Riding around the fictional island of Medici using Rico's grappling hook, parachute and infinite supply of C4 explosives, Just Cause 3 comes off like a Michael Bay-directed music video for a party remix of the "1812 Overture." As Rico, I zip up a guard tower, plant a bomb, parachute away and plant more bombs on trucks going over a bridge. Then I light the whole thing up like a cosmic catastrophe. The guard tower crumbles realistically as the trucks ruin the bridge's structural integrity, making the whole thing tumble to the island floor blow. After the impressively thick dust and debris settle, what's remarkable to me isn't the scale of destruction or the creative freedom to pursue it. What's amazing is how, even in this early unpolished version of the game, it's all so easy to pull off. Just Cause 3 comes off like a Michael Bay-directed music video for a party remix of the "1812 Overture." 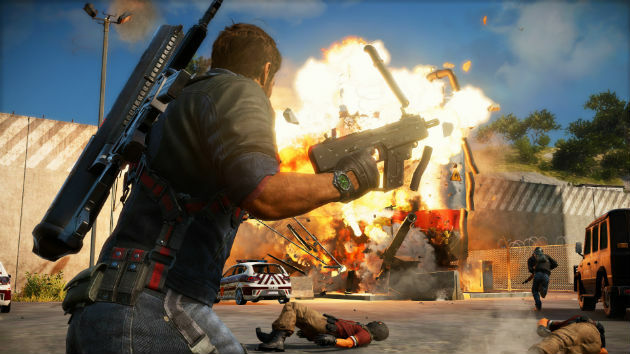 Avalanche Studios has been evolving the Just Cause series for years, with each installment offering bigger opportunities for destruction than the last. Just Cause 2 introduced a massive tropical world back in 2010. Just Cause 3's most welcome improvement is how smoothly it lets you pull off the same sort of pyrotechnics highlighted in its debut trailer. Picking up an Xbox One controller –- the build was actually running on a PC –- I acclimate quickly to using Rico's various tools. 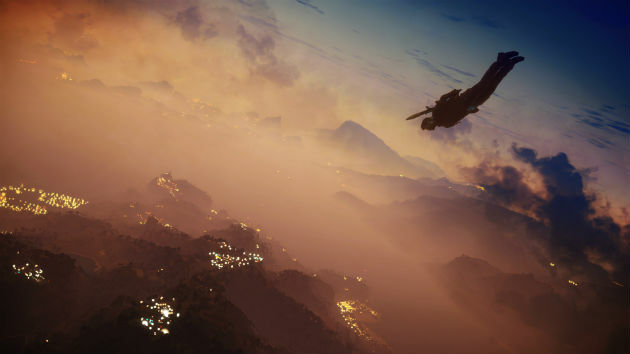 All it takes is getting a feel for the physics-be-damned momentum of using his grappling hook and parachute, each deployed with just a tap of a button, and Just Cause 3 takes on a smoothness absent from its predecessors. That it's so easy to control makes it much easier to enjoy and discover new options for annihilation. Medici is vast and beautiful, a Mediterranean island chain nation whose three central landmasses are teeming with stucco-walled buildings in quiet villas, fields of sunflowers and facilities full of armed soldiers. Justifying Rico's reign of fire is a story about Di Ravello, a mad Gaddafian dictator (big hat, aviators, robust propaganda machine, et cetera), controlling the country. This being Rico's homeland, he's trying to take Di Ravello down one town at a time, sowing discord by blowing up statues of the ruler as well as his propaganda. Rico's gleeful exploitation of the laws of gravity is one of Just Cause 3's great pleasures. The story feels almost like a moot point considering how unreal the game is. Fixtures like the statues and the radio towers spewing pro-Di Ravello diatribes can be destroyed when liberating a town. They won't reappear after they're taken down. Meanwhile other buildings and structures you destroy will pop back up between play sessions. Any kind of drama that might build out of you nearly ruining your hometown in the process of saving it is washed away by the game's fussy sense of permanence. If some stuff comes back, but other structures don't, why would I emotionally invest in all the explosions I'm setting up? Just the pretense of a serious story in Just Cause 3 feels out of place. After I attach a military jeep to a helicopter using the grappling hook and destroy both by flying them into a sailboat, everything pops back up a bit later after I die and restart. Medici is a place that's impossible to take seriously. This lays bare how hollow Just Cause 3 will feel to anyone looking for a traditional structure for in-game activities. The build I'm playing, restricted to the first island, is largely devoid of the specific missions typical in open-world games like this, Grand Theft Auto or the popular Batman games. I get a chance to rescue some civilians from Di Ravello's thugs and even stumble on races that had me steering cars and airplanes through brightly marked checkpoints, but all these goals felt weirdly simplistic compared to the bizarre stuff I could do just toying around with Rico's arsenal. This lays bare how hollow Just Cause 3 will feel to anyone looking for a traditional structure for in-game activities. How I accessed that arsenal might be impossible in the final version of the game. During Lesterlin's stage demo, he has Rico access a menu to call for supplies that are then delivered by rebels fighting against Di Ravello's forces. In the demo I'm playing, though, I can access a cheat sheet that automatically plops any weapon or vehicle I want right into the game. Summoning up a fighter jet is as simple as snapping my fingers. It's not clear if I have to build up to that sort of access with the rebels. Using a gun is never the most interesting option in Just Cause 3. 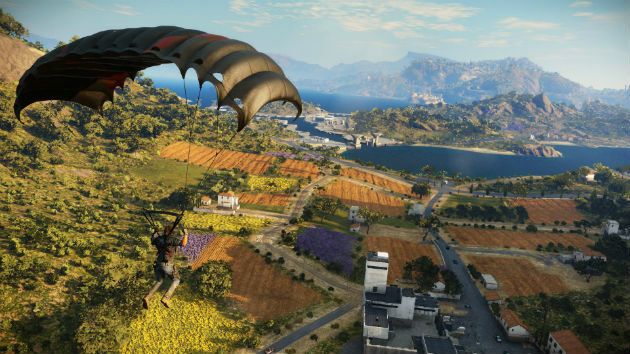 Some limitations might be a good thing for someone who's just picking up Just Cause 3. Causing chaos with more limited means certainly sparks my creativity. It forces me to learn how best to use Rico as a force, a hurricane tearing through the island. Whether or not it gives everyone access to the full toy box when it comes out this fall, Just Cause 3's pleasures are entirely dependent on the player's disposition. If you need structure and goals to get the most out of a game, then look elsewhere. If you cackle like a madman after finally figuring out to chain together seven speedboats so they all blow up at the same time and land on a tractor you drove into a harbor, then Avalanche has built your ideal playpen.